Back in June last year, I did the keynote at the first TM Geography Icons. I asked a number of esteemed colleagues to send a message to the assembled teachers, and some of them are worth repeating at the moment, as we reach a stage in the year when some are feeling the stress of the dark winter term, and the pressure to finish teaching courses before the exam season. 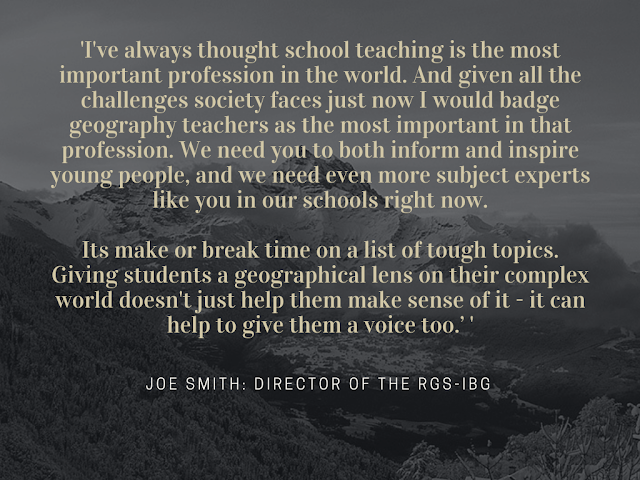 Here's a message from Joe Smith, Director of the RGS-IBG. Tickets are now available for this year's running of the event, and I have secured mine already, so see you there.